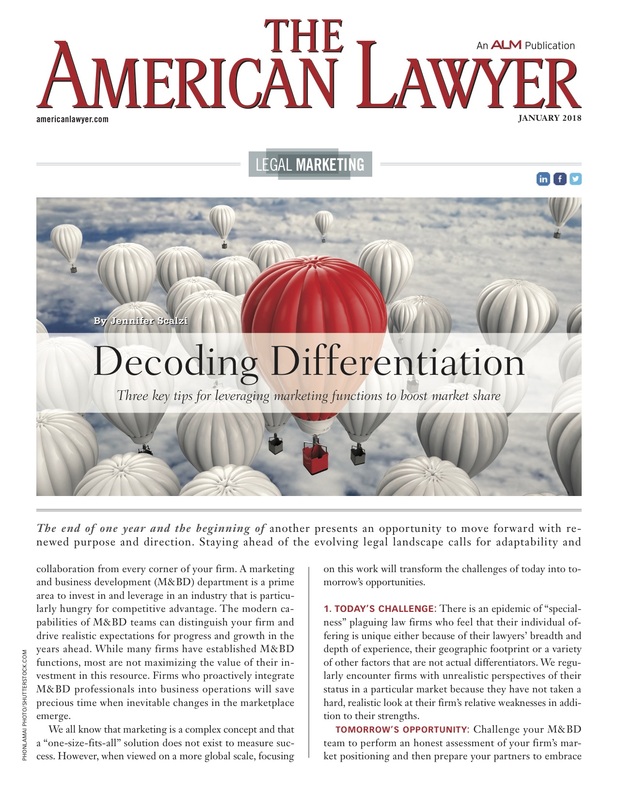 Editor’s Note: This is the first of a new, monthly column in The American Lawyer that will focus on legal marketing and how lawyers and marketers can better work together. The end of one year and the beginning of another presents an opportunity to move forward with renewed purpose and direction. Staying ahead of the evolving legal landscape calls for adaptability and collaboration from every corner of your firm. A marketing and business development (M&BD) department is a prime area to invest in and leverage in an industry that is particularly hungry for competitive advantage. The modern capabilities of M&BD teams can distinguish your firm and drive realistic expectations for progress and growth in the years ahead. While many firms have established M&BD functions, most are not maximizing the value of their investment in this resource. Firms who proactively integrate M&BD professionals into business operations will save precious time when inevitable changes in the marketplace emerge. We all know that marketing is a complex concept and that a “one-size-fits-all” solution does not exist to measure success. However, when viewed on a more global scale, focusing on this work will transform the challenges of today into tomorrow’s opportunities. 1. Today’s challenge: There is an epidemic of “specialness” plaguing law firms who feel that their individual offering is unique either because of their lawyers’ breadth and depth of experience, their geographic footprint or a variety of other factors that are not actual differentiators. We regularly encounter firms with unrealistic perspectives of their status in a particular market because they have not taken a hard, realistic look at their firm’s relative weaknesses in addition to their strengths. Tomorrow’s opportunity: Challenge your M&BD team to perform an honest assessment of your firm’s market positioning and then prepare your partners to embrace and act upon that reality. One trend that may help you think differently is an industry vs. practice orientation. As a first step, take a deep dive into the top five industries that are critical to your firm’s business, regardless of practice. Use that information to determine if the market is pointing to their economic longevity, where their hubs are located and if those are emerging or stagnant business markets. From there, you can determine where your bench strength is accordingly. When you cut the data this way, you may be surprised to find that you have unrealized strengths that could turn into legitimate differentiators. 2. Today’s challenge: It’s risky to view active and undistracted thinking as a luxury. As a lawyer, you are captive to the billable hour, and anything that falls into the category of non-billable equates to “not profitable” and therefore less of a priority. As a result, M&BD activities, idea generation and research drop to the bottom of the list because the investment of time can’t be quantified using the same metrics. Tomorrow’s opportunity: Empower your M&BD professionals to hold you accountable for “think sessions” where you work through what you are trying to achieve, and to arm you with the tools you need in your arsenal to recognize success. New technologies provide unprecedented access to information about clients and markets, and possess growing power to target and focus programs against those markets. According to a recent study published by Calibrate Legal, the average large law firm marketing department has 17 pieces of marketing technology. How can you best leverage these resources to reach your objectives? Your M&BD team should have a keen eye on how your plans contribute to the firm’s overall bottom line, be armed with best practices for bringing your ideas to fruition, and be adept at measuring success. They should also serve as the cross-pollinators within your firm to ensure that ideas don’t live in a vacuum, and to help you leverage any other programs or campaigns that may benefit your agenda. Tomorrow’s opportunity: Be the firm who asks. If most don’t ask, this represents a huge area of opportunity. Having an active and ongoing dialogue with your clients and the business managers within the GC’s office will help you deliver better service, and will enhance your level of service to other clients. The “downside” is that you may hear feedback that is not all glowing, but in this state of discomfort is where opportunities lie. Work with your M&BD team to develop a formal, systemized process for seeking feedback from your clients. And be prepared to act upon what you learn. If you are going to demonstrate to your client that you’re serious about using the information they have taken the time to provide, you must incorporate that feedback into the relationship moving forward. Transformation is imperative for the law firm of the future and it does not occur in one’s comfort zone. A transformative firm does not lie in waiting to see what other firms do and then repackage it to fit their branding. If you do what everyone else is doing then you are the same as everyone else. True differentiation takes confidence and the courage to take action. We are fortunate to live and work during a time when our bold acts can, and should, be fortified by hard data to guide us through the risk/reward test. Competent leaders must be willing to test new solutions, experiment with fresh strategies, learn from failures and be resilient enough to recover quickly. While these scenarios represent only a few areas to explore, you should ensure that your M&BD teams are empowered to hold your firm accountable, embrace change, and oppose complacency. It will take a fair amount of honest self-reflection, patience and commitment to weather the resulting changes. But, those with the resolution to embrace the discomfort will be the ones left standing. Jennifer Johnson Scalzi is a member of the board of directors of the Legal Marketing Association and the CEO of Calibrate Legal, Inc. She can be reached at jennifer@calibrate-legal.com. Reprinted with permission from the January 2018 edition of The American Lawyer © 2018 ALM Media Properties, LLC. All rights reserved. Further duplication without permission is prohibited, contact 877-257-3382 or reprints@alm.com.